Health & BeautyNOW Foods SAMe - 30 tabl. Unikalne połączenie najwyższej jakości berberyny oraz kurkuminy pochodzących z naturalnych ekstraktów! Solidne dawki substancji aktywnych zapewniają realne wsparcie organizmu. Wspierają między innymi układ pokarmowy oraz szybką regenerację stawów. Sięgnij po najwyższą jakość! 6PAK Nutrition Effective Line is a line of the highest quality supplements at attractive prices. The products of this line also included Rhodiola Rosea - a dietary supplement based on root extract and unprocessed root. Rhodiola rosea has adaptogenic properties and is recommended for athletes and mental workers. Olimp Gold Omega 3 D3 + K2 - 30 kaps. High-quality health-promoting preparation based on a solid dose of omega 3 and the addition of vitamin D3 and K2 in a very well absorbed chemical forms. Bet on a proven and reputable manufacturer and enjoy the action every serving! NOW Foods SAMe - 30 tabl. S-adenosylmethionine (SAM-e) is a derivative of adenosine and methionine, and one of the most important of methyl donors in the central nervous system. 50 loyalty points Your cart will total 50 points that can be converted into a voucher of 2,00 PLN. NOW Foods SAMe - 60 tabl. Methylation (attachment of methyl groups) is a fundamental process in order to ensure the proper functioning of many organs. 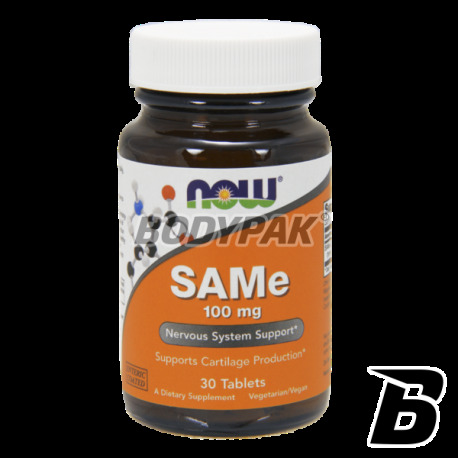 SAM-e is involved in many biochemical reactions in the tissues, including liver, joints, and brain. SAM-e is also required in the biosynthesis of important neurotransmitters and hormones. The supplementation of SAM-e: The process of production of SAMe obtained two isomeric forms of S, S and R, S. S, S isomer is the active form that mediates the biochemical activity in a human body, wherein a form of R, S is considered to be biologically inactive. Italian material used in our SAMe was processed in order to obtain the highest percentage of available pure form of the active isomer S, S on the market. SAM and joint function SAM-e may enhance the protection of cartilage and promote the synthesis of proteoglycans, important components of connective tissue. Clinical studies demonstrate the ability of SAM to increase mobility and movement, and to support joint function. SAM and the health of the nervous system reactions catalyzed methyl SAMe promote the synthesis of neurotransmitters that contribute to the promotion of high mood. Same can also adjust the production of phosphatidylcholine, supporting cognitive function. SAMe and liver functions SAMe increases the synthesis of hepatic glutathione antioxidant. Glutathione helps detoxify and protect the liver. Studies show that SAMe can protect the liver tissue from damage caused by a lot of toxins. 1 Tabl. 1-2 times a day on an empty stomach. Lab One Quercetin Plus - 90 kaps. High quality seeds of Plantago psyllium (Grandmother psyllium), which are the source of natural fiber. Improves intestinal peristalsis, supports the development of normal microflora of the digestive system and assists the body in removing toxins. Olimp Chrom Activ 200mcg - 60 kaps. Suplement diety dostarczający wysokiej ilości chromu - aż 200 µg jonów tego pierwiastka w 1 tabletce! Najwyższa jakość w dobrej cenie! Swanson Tocotrienols 50mg - 60 kaps. Sensational formulation based on high quality tocotrienols extracted from Annatto - also known as Bixa Orellana. Improves health and general condition of the body. Sensational preparation pro-health! A solid dose - 50 mg in each capsule! Activlab Ashwagandha - 60 kaps.